Today many cities seek to create favorable conditions for investors, and the modern knowledge economy, a fast changing field with growing importance, starts to attract their attention. The knowledge-intensive companies, however, have specific new needs, to which the municipal authorities need to respond. 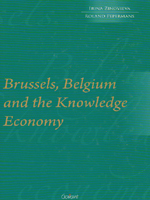 What are considered favorable conditions for the traditional economy may not necessarily be appreciated by the agents in the knowledge economy. If dissatisfied, the latter can easily choose to move to another city, thus creating winners and losers. This book is interested in one particular city - Brussels. It investigates the position and chances of this city in today's emerging knowledge economy.